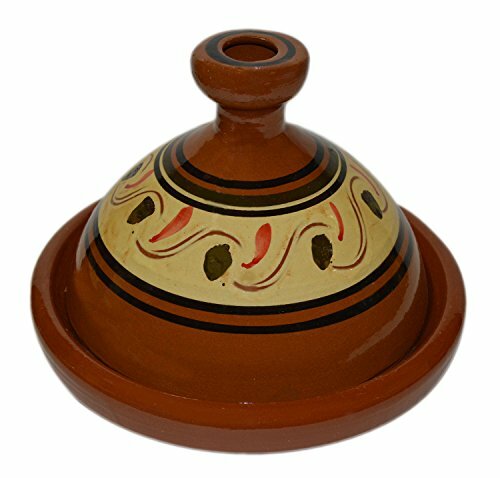 Simple and functional, this authentic, handcrafted Moroccan cooking Tagine is ready to be used for your next flavorful and exotic Moroccan meal.The Tagine is to be use on the top of electrical or glass stove or inside the stove. If you have a gas stove with flames please use a protective metal piece to protect your Tagine from cracking. HOW TO CURE A TAGINE? It is necessary that it is seasoned before initial use. Please follow these simple instructions below for maximum results: 1. WATER: The new tagine needs to be first submerged in water for at least 1 hour. If you can't submerge it, place it in a clean sink bowl and slowly fill the base of the tagine with water until it stops absorbing it. Place the tagine lid on top and fill it as well. Let stand for 30 minutes to allow full absorption of water into the clay. Empty excess water and set to dry for 5 minutes. 2. OLIVE OIL: All you need is 3 table spoons of olive oil, 2 for the base and one for the lid. Spread the olive oil throughout the base and lid with your hand. 3: HEAT: While the tagine is still wet with the oil applied to it, place it in the oven as shown in the first or second photos, and set temperature at 350 F and leave for 45 minutes. The evaporation of moisture creates a vacuum effect to pull the olive oil into the clay which glazes and seals it. Then leave the tagine cool down in the turned off oven.